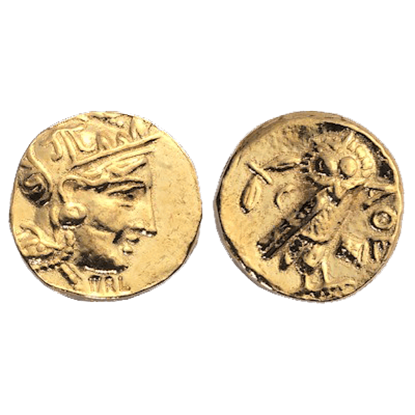 This reproduction Athens Gold Stater coin depicts Athena wearing a helmet on the obverse and an owl on the reverse. 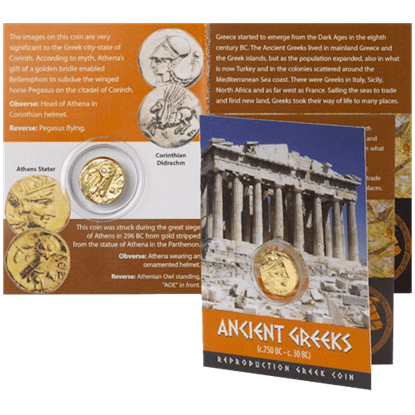 These Athens Gold Stater Replica Coins come 10 coins in a pack, so you can fill your coin purse. 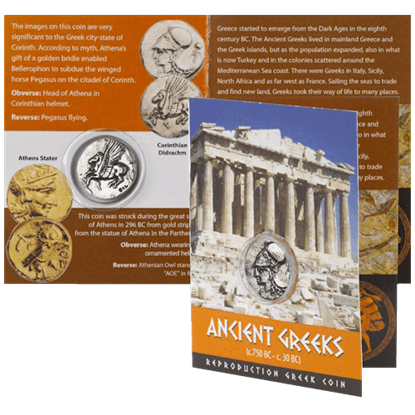 The images on this reproduction Athens Greek Coin are very significant to the Greek city-state of Athens. The coin is held in a clear plastic blister and is supplied in full color pamphlet packaging, complete with historical information. 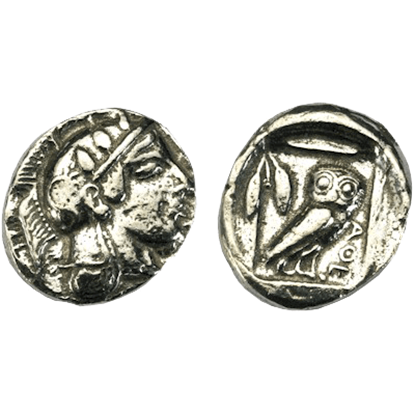 This reproduction Athens Silver Didrachm coin depicts Athena wearing a helmet on the obverse and an owl on the reverse. 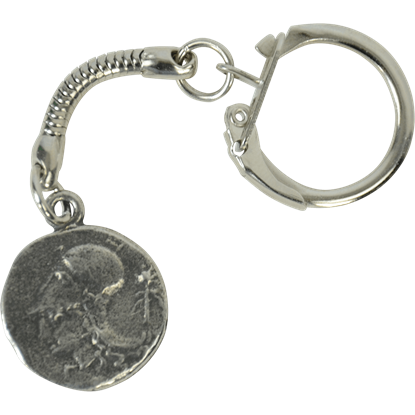 These Athens Silver Didrachm Replica Coins come 10 in a pack, so you can fill your coin purse. In mythology, Atlas was a titan condemned by Zeus, and his punishment was to carry the sky, keeping it forever separated from the earth. 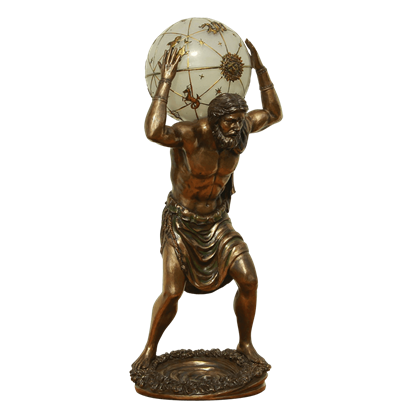 This Atlas Night Light Lamp depicts that very act, showing the titan as he holds up the sky. Atlas of Greece is referred to as the Titan of Strength for his well-known feat of holding up the sky. 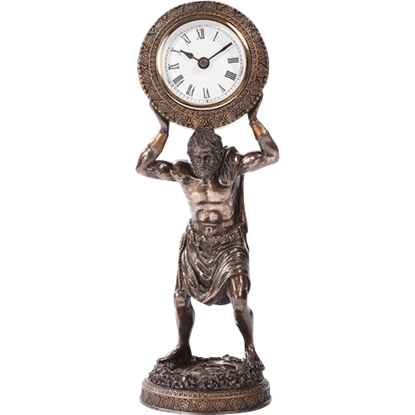 This Atlas the Titan Desk Clock depicts a unique spin on his iconic image, making it a must have for your home or office decor. 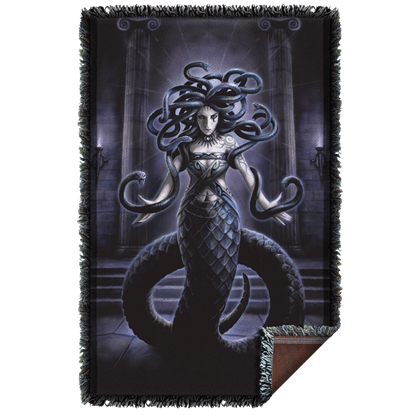 Greek goddess of wisdom, justice, and war strategy, Athena served as the patron of heroic endeavors and the city of Athens. 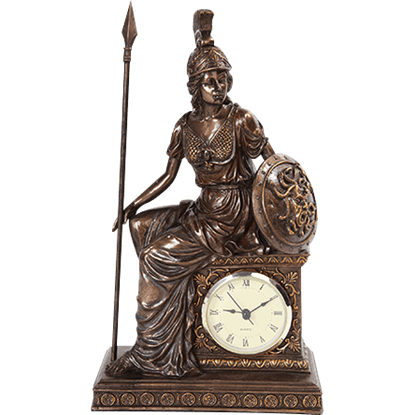 The Bronze Athena Clock makes an excellent home accent to show your interest in this classical figure. 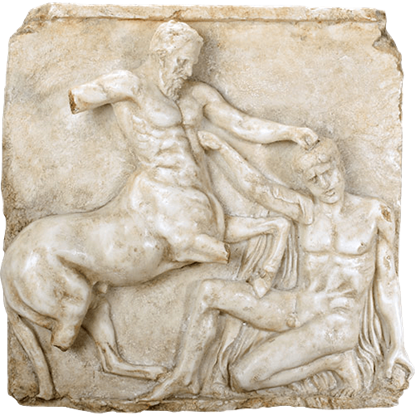 The Centaur and Lapith in Mortal Combat Greek Wall Plaque is a reproduction of surviving art found on the columns of the Parthenon in Athens. 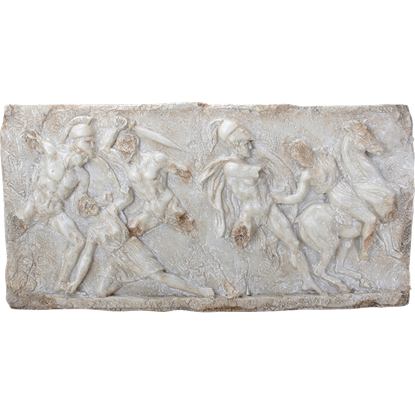 This cold cast resin plaque has been painted by hand to look like ancient white marble. The images on this reproduction Corinthian Didrachm coin are significant to the Greek city-state of Corinth. According to myth, Athenas gift of a golden bridal enabled Bellerophon to subdue the Pegasus on the citadel of Corinth.